Molokhia or Mulukhiya, commonly known as Egyptian Spinach, Mallow, Nalta Jute, or Tossa Jute is an annual herb native to ancient Egypt. It's leaves are used and prepared as a vegetable and it is a staple ingredient in Middle Eastern, East African, and North African cuisine. Sometimes referred to as Middle East's super-green, Molokhia is packed full of vitamins and minerals. It's rich in fiber, potassium, iron, calcium, magnesium, phosphorous, and selenium, as well as vitamins C, E, K, A, B6, and niacin. 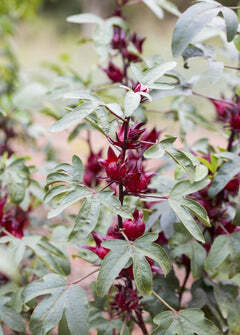 Molokhia has dark green leaves, green and red stems, vibrant yellow flowers, and seedpods that somewhat resemble okra. Plant Molokhia in the Spring and enjoy harvesting it all Summer long. The average height is 2 ft but Molokhia can grow as high as 10 ft in just one growing season. That's a lot of fresh Molokhia! Soil & Moisture: Deep loose soil, sandy or clay. Molokhia likes hot, warm conditions with little moisture needed once established.